FILE - First lady Melania Trump visits The Royal Hospital Chelsea in central London, July 13, 2018. "This will be my first time traveling to Africa, and I am excited to educate myself on the issues facing children throughout the continent, while also learning about its rich culture and history,'' Trump said in a statement released Monday. The president created a global outcry when he reportedly used the term "s---hole countries" when speaking about immigrants from Haiti, El Salvador and African nations. He has since denied making the remarks. Melania Trump's spokeswoman, Stephanie Grisham, said the first lady chose Africa for her first major solo international trip after she learned about some of the development programs that are under way in many of its countries, especially in children's health and education. Additional details about the first lady's trip were not available. During President George W. Bush's second term, Laura Bush made five goodwill trips to Africa to raise awareness about HIV/AIDS and malaria. 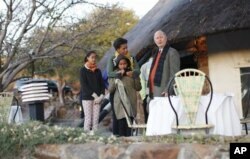 FILE - First lady Michelle Obama stands with daughters Sasha and Malia as she talks with Ian Kirby of Mokolodi Game Reserve before having a private dinner in Gaborone, Botswana, June 24, 2011. Michelle Obama also visited Africa at the end of her husband's first term. She traveled to South Africa and Botswana with her daughters, Malia and Sasha, and her mother, Marian Robinson, a niece and a nephew. During the visit, the first daughters accompanied their mother on a visit with South African leader Nelson Mandela at his home.